I’m sure I speak for many when I say my favorite part of spoiler season is paging through new cards and looking for ones that fit into my pet decks. The leaked Shadows over Innistrad spoilers revealed Invasive Surgery and the delirium mechanic. As a Tarmogoyf enthusiast, this keyword spoke to me on a competitive and an ethereal level. Reading the delirium cards spoiled thereafter felt like sacrificing a bunch of Clue tokens. My life had real meaning again. A purpose deeper than mulliganning into Sol lands. In this article, I’ll discuss possible additions to Temur Delver from Shadows over Innistrad and explore how one particular card, , stands to redefine the way I build Modern decks. Since Wizards’ card design over the last decade pushes increasingly for midrange archetypes, big, splashy creatures take up the higher rarity slots. Indeed, if we look at any of Modern’s midrange decks, they’re full of rare cards. Consider recent additions to Modern midrange. Siege Rhino, Kolaghan’s Command, and Kalitas, Traitor of Ghet are all rares. Even Eldrazi has hardly any commons and uncommons. Tempo, on the other hand, is an archetype defined by mistakes. Ponder, Lightning Bolt, Delver of Secrets… these underestimated commons represent leaps in applied power that not Wizards or anyone else could have accounted for. All that text to say when I scroll through spoilers looking for Temur Delver additions, I vest great hope in the common section. That’s where we found the last few big cards we got: Hooting Mandrills, Stubborn Denial, and Treasure Cruise. Shadows breaks the trend by not giving us a great common, though – instead, it gives us a great rare. offers us serious midrange bulk while weaving effortlessly into our tempo plan. It makes our sideboard more robust and helps us take on our worst matchup, BGx Midrange. The first change here from my previous versions involves adding more card types to support delirium. 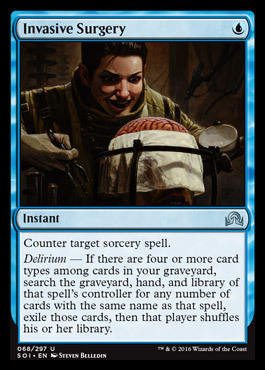 Having a wider variety improves the odds of milling a delirium enabler with Thought Scour. If we played two Tarfires, the second wouldn’t add to our Tarmogoyfs; Seal of Fire does. I love Seal against creature-based combo decks like Abzan Chord, since it lets us tap out and have a burn effect ready to break up a combo. The “Traverse package” takes up some sideboard slots in this deck, and those slots are very competitive. Consequently, I tried to keep the toolboxing to a minimum, only including creatures that address specific weaknesses or matchups very efficiently. Magus of the Moon: Replaces Blood Moon #3. I like having a searchable one, and some decks – Abzan, Sultai, Ad Nauseam – can’t easily remove the creature. Izzet Staticaster: Guns down dorks for a whole game, and significantly counters Lingering Souls. 1/1 Spirits can prove very annoying, since they team up to trade with Delver or just chump Tarmogoyf for four turns. Snapcaster Mage: I currently have Tiago in the mainboard, but he’s definitely one of the deck’s weaker cards. Whether in the main or the side, though, Snapcaster needs a spot in this deck. It would be wrong to omit him from a Traverse toolbox package. Having the ability to search up Lightning Bolt or Stubborn Denial is frequently game-winning. Against attrition decks, Temur Delver boards in a huge pile of threats for air like Thought Scour and Gitaxian Probe from the main. A high threat density helps us keep the pressure on attrition strategies, but an unflipped Delver doesn’t offer much pressure by himself. One problem I sometimes run into post-board against Jund and Abzan is that my Delver rarely flips with fewer than 23 instants and sorceries in the deck, a number I consider low but acceptable. solves this problem by increasing threat density while helping us hit that magic number. The following cards I considered for Temur Delver, but ultimately decided against. A conditional counterspell that, like Spell Snare, never has “nothing” to hit. Against BGx, Surgery takes discard spells and maybe a Maelstrom Pulse; against blue anything, it counters Serum Visions. That said, Surgery’s no Spell Snare; Snare hits the best cards in Modern (Tarmogoyf, Confidant, Snapcaster Mage, Terminate, etc. ), while Surgery just counters small set-up cards in most matchups. I love the idea of Surgery, but don’t think Temur Delver needs a souped-up Envelop at the moment. Stubborn Denial simply covers more bases, and while Surgery always hard-counters, we have ferocious enough to ensure Denial usually gets the job done. I won’t run Surgery now, but that doesn’t mean I never will. If decks start popping up in spades, or if linear combo decks like Living End and Scapeshift have strong showings after the April announcement, I can see Surgery making the cut in the sideboard. The possible upside on this card is so great that StarCityGames has it preordering for a dollar a copy, and foils at five. definitely has one of the coolest designs in the set, and gets my vote for the best. But is it playable? For Temur Delver, Invasion looks great on paper. It’s at once a removal spell, a buff threat, and a delirium enabler. Imagine the best-case scenario: you play Tarmogoyf. Your opponent plays Dark Confidant. You give Bob a . Bob suicides into your Tarmogoyf. You get a 3/4 . Icing on the cake: once the Shedder’s lived a fulfilling, Bolt-proof life on the battlefield, his corpse grows Tarmogoyf from the graveyard. On to the bad stuff. For Invasion to work, it requires a lot to go just right. First of all, it will only do anything against creature decks – this card starts off a pseudo-removal spell, and only becomes with a host. Among those creature decks, it can only enchant certain creatures to provide results. Invasion does nothing on a Blighted Agent, or on Glistener Elf when opponents have pump spells to grow their attacker past Tarmogoyf; the aura looks equally silly on Memnite or Ornithopter when those creatures can tap to Springleaf Drum before combat. (Same deal with Noble Hierarch and other mana dorks.) Besides, we would rather spend our precious removal spell slots on something not called Memnite against Affinity. The nail in the coffin for this card is that our opponent having a creature we want to kill still isn’t enough for to do anything. We need to kill that creature to get the Shedder. It has to be small enough for Lightning Bolt to handle, or smaller than a threat we already have on the board. Generally, if we have a big creature on the table, we would rather our cards be removal or permission to maintain board advantage. A two-card-combo aura is not what we want to draw here, especially since it necessitates leaving Tarmogoyf or whoever on defense. My verdict: Invasion asks us to jump through too many hoops. Its two sides also don’t mesh. In most matchups, we either want a lot of creature disruption, or we want extra threats. Invasion is an extra threat that also forces us to pack ample creature disruption. Hexproof Hooting Mandrills is already a major improvement over for Temur Delver. Gloom at least doesn’t force us to stretch our mainboard thin with removal and threats against the attrition decks we want extra creatures for in the first place. Those opponents often turn on delirium for us with their Thoughtseizes, Lilianas, and Decays, and as long as Gloom doesn’t get walled by Tasigur or Tarmogoyf, he’ll give attrition decks an incredibly hard time. One problem with Gloom is its high casting cost. We can only really play it against BGx Midrange, since it’s harder to count on drawing three lands in a timely manner against anyone else. Additionally, the enchantment does literally nothing without delirium, so we can’t run it against linear decks that refuse to interact with our creatures. It’s also too slow in those matchups to make a lasting impression; even if it comes down on time, tapping out on turn three against combo decks like Storm is asking for it. The biggest strike against this card is that we have better options available. Huntmaster of the Fells is another late-game threat that shines against attrition decks, but also has applications against most flavors of aggro. It’s hard to make a case for in the sideboard if we haven’t already maxed out on the Human Werewolf. 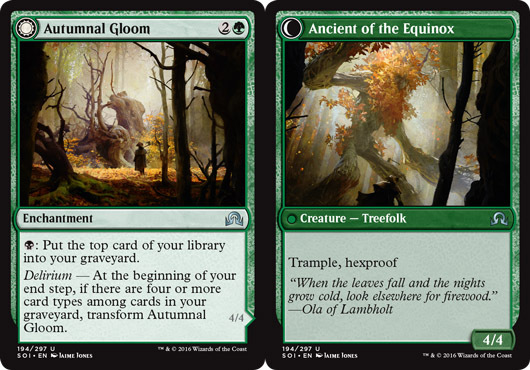 Gloom might also be worse here than , which fetches and lets us cast Tarmogoyf for the same amount of mana. Traverse has the huge upsides of also finding us bullets, flipping Delver, and fixing our mana early on. This card was hyped into oblivion for blue decks of all strains, including Delver. I was even a believer at first, and tested Thing in some UR Delver builds for a few days. But the creature always underwhelmed me. The best card to compare Thing to is Young Pyromancer. Thing’s big advantage here is its immunity to Bolt, but Pyromancer boasts a functional immunity to edict effects. Beyond that distinction, Thing gives pilots nothing in return for removing just three ice counters. If opponents remove Thing before it flips, we’re left sobbing. For his part, Pyromancer starts recruiting an army. He also swings in a topdeck war. I don’t know how squeamish you guys are, but drawing Thing with no cards in hand against BGx would give me night terrors. Another issue with Thing is its exclusivity. We can’t play Thing and Pyromancer together, because Thing bounces all the tokens. We also can’t pair it with Delver of Secrets, because we’d have to transform the Human Wizard again. Lastly, bouncing Tarmogoyf incurs a huge tempo loss. The only Delver creature that synergizes with Thing is Snapcaster Mage, but he does so best in a non-Delver shell. Thing does look splashy on paper, and it may show up in Modern, but I seriously doubt this card will see play in grow decks. Earning more of an honorary mention than anything, Scavenger is our “fixed Tarmogoyf.” Except it’s more like a nerfed Tarmogoyf. At least they gave it a completely irrelevant tribe – “Fungus!” Flavor win? When I pined for a fixed Goyf last week, I meant a Goyf that wouldn’t always be strictly worse than Modern’s posterboy. If we have delirium, our true Goyfs are definitely bigger than this guy. And I wanted to swing with two 4/5s at once. I know, I know – pipe dreams. As far as my analysis goes, is the big winner from Shadows over Innistrad. And the card doesn’t just show promise in Temur Delver. My other go-to Modern archetype, GRx Moon, is arguably even more of a Tarmogoyf deck. Once upon a time – specifically, about eight months ago – I brewed an illegal Modern GR Moon deck around Green Sun’s Zenith. With Dryad Arbor, Zenith acted as a dork on turn one to accelerate into turn two Blood Moon. But the real reason so badly wanted to play with the card is it let me run eight Tarmogoyfs. With Traverse, 8Goyf finally becomes a reality. In a deck that consistently grows Goyfs to 7/8 and beyond, having access to eight of them makes us… well, Eldrazi. In the past, I’ve employed Sword of Light and Shadow, Siege Rhino, Goblin Rabblemaster, and Stormbreath Dragon as Goyf’s supporting cast, and none ever held a candle to the spiky dude. might not ramp with Arbor, but it gives us the extra Goyfs we’ve always wanted. It also searches Magus of the Moon, meaning we now play ten functional Blood Moons. As with the Temur Delver sideboard package, GR Moon’s mainboard lacks the space for a full-on toolbox. I’ve included more specific bullets in the sideboard, and allotted three mainboard slots for the cream of the crop. Grim Lavamancer: Isochron-Bolt against small aggro decks like Infect and Chord. Shoots annoying mana dorks that defy our Moons. We can get Lavamancer early enough to make a difference with Faithless Looting, which immediately turns on delirium in this deck. Scavenging Ooze: Generic graveyard hate and a concession to this deck’s horrible Grishoalbrand matchup. Ooze is also randomly helpful against Snapcaster Mage, Lingering Souls, Jace, Vryn’s Prodigy, Kitchen Finks, and Tarmogoyf. 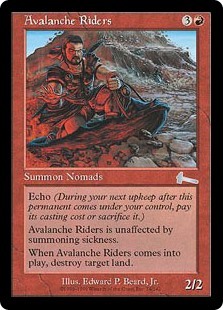 Avalanche Riders: I’ve advocated for a set of Stone Rain in the GRx Moon sideboard since I first developed the archetype. In two-color versions, I prefer Boom // Bust, as we don’t mind playing four colorless lands in Darksteel Citadel. Boom is cheap enough to earn mainboard slots. Since I started testing land destruction in the main, I’ve loved it. Having the option to blow up a lone basic wise opponents fetch out can be game-winning. Thanks to Traverse, we can now search for a Stone Rain effect on command. Most of these choices are self-explanatory, so I won’t describe them all. In anticipation of some confusion, though, I’ll say that Gaddock Teeg is very easy to cast between Hierarch and Sprawl, and turns off Through the Breach, Ad Nauseam, and the ubiquitous Disrupting Shoal. We have lots of space in the sideboard for bullets, and I can see splashing other colors for certain creatures if the need arises. Traverse makes this deck very adaptable. When I proposed a Temur Toolbox shell last week, I didn’t mean to imply Modern will become a smattering of tricolor Goyf decks. But as continues testing well for me in Temur Delver and GR Moon, I increasingly doubt interactive Modern decks won’t integrate the card on some level. Running Tarmogoyf isn’t a huge “cost,” as evidenced by the format’s many interactive lynchpins that run him already. Format changes tend to inspire other changes, and I won’t explore all of Traverse’s possible effects on Modern today. But one thing I’m anxious to watch unfold is the amount of graveyard hate present in the format. 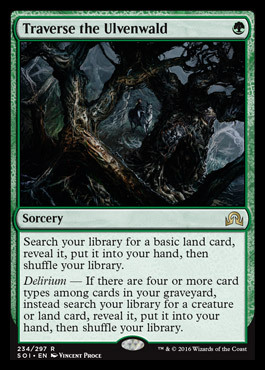 Cards like Rest in Peace and even Relic of Progenitus do a real number on decks packing delirium cards and Tarmogoyf. Luckily, I don’t need to lonelily theorize for long. Shadows comes out in a matter of weeks, and we’ll find out for sure how delirious it makes Modern deckbuilders! All it’s really netting you in that case is a 2/1. It’s probably better most of the time to Traverse for a real card and then Snap-Traverse into another real card when you draw Snapcaster Mage. But yeah, if a 2/1 body will win you the game, we do have that option. Really excited about Traverse the Ulvenwald in Temur Delver. I don’t know how I feel about only a singleton Tiago, though – I recognize his value is somewhat curtailed in a deck that runs Disrupting Shoal (which is a terrible Snap target), but a part of me thinks you want to see him enough that a 2-of could be appropriate. 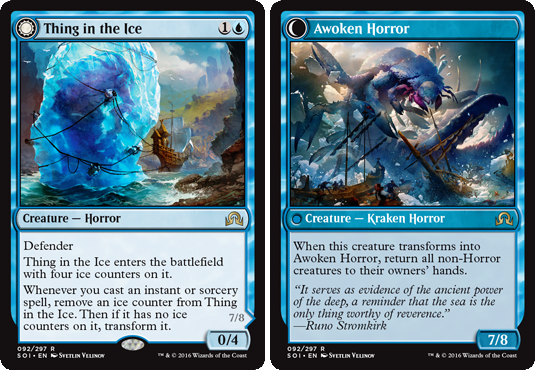 I’m also unsurprised by your conclusions regarding Thing in the Ice – my gut feeling is that it will thrive in Jeskai Control, where it can be fueled by their extensive spot removal package. Its 0/4 form is also relevant in that shell as a way to fend off early aggro pressure. 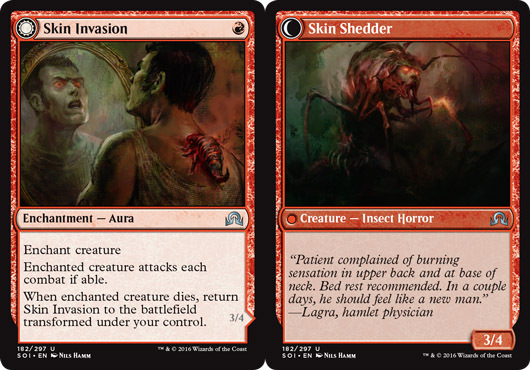 Skin Invasion feels like a strong card, but I’m not quite sure where it goes yet. Delver can’t afford to gamble with its resources in order to play it, Jund has more efficient threats, and red aggro decks won’t like the 2-part process of enchanting it then killing it. Perhaps Mardu Midrange (which has more removal than it knows what to do with) or Grixis Control? I also am unsure how I feel about Moldgraf Scavenger. On the one hand, the lack of top-end power is apparent, particularly in decks like the ones in this article (where the whole point behind certain cards being in the 75 is to feed the Goyf). However, it’s more resilient to graveyard hate than Tarmogoyf is (since you at least get to keep a 0/4 blocker), and is always Bolt-proof (so it can be a 2-drop way to stall while you get your graveyard properly filled. Not to say that it will necessarily find a home here, but it should fit in somewhere. Snapcaster is the worst card in this deck, so we really don’t want to see him enough to play two. I only want to see him in Game 1 against attrition decks and against linear aggro decks when I draw 3+ lands. If not for the Traverse package in the sideboard, I would cut him entirely. I think you are undervaluing Skin Invasion’s alternate mode: enchanting one of your own creatures. The downside of having to attack every turn is very real, but there are plenty of times where you were going to do that anyways. But then you create a creature that your opponents have a hard time killing since it will just come back as a 3/4. I really don’t feel like it is enough to push it over the edge in playability, but it is worth noting and almost makes it worth testing, in my opinion. Other than that nice article as usual! I’m glad to see others are as absolutely pumped for Traverse as I am. Ive put together the GR Moon deck but am trying to figure out your choice of Burning-Tree Shaman. Is it purely for shutting off kiki combo/chord combo?